An object floats on the surface of water on the principle of having density less than water. Weight doesn’t hinder floating, as we can see huge ships floating in the seashores. Even the gigantic icebergs at North Pole do not seem to sink in the ocean water unless they melt back into the water. It is at this point that the topical question arises. Ice is just solidified physical form of water naturally occurring in liquid state under moderate ranges of temperatures. The conversion from liquid into solid state takes place under temperatures below 0o C. Physically solid state differs from the that of the liquid state in the arrangement of molecules — in the former case molecules get tightly packed with their movement reduced to vibration while in the latter case they are highly mobile. Over the course of freezing ice traps some air packets in it and the ratio between mass and volume reduces below the density of water. This explains why ice is less denser than water and why does it float. However, this air trapping can be avoided by heating water before freezing. But still ice won’t sink like a stone or rock in water, no matter how high volume it may entail. 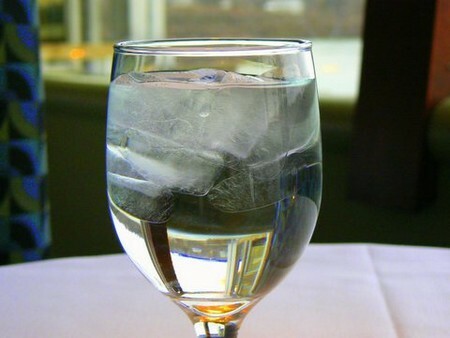 How much ice is lighter than water? Normally substances are denser in their solid state than in liquid state. This does not apply to water because of its peculiar hydrogen bonding. In a water molecule, there are two hydrogen and one atom of oxygen joined together via covalent bonding. In addition to this bonding, water molecules as a whole are also attracted by each other because of the presence of partial negative poles on oxygen atom of each water molecule and the partial positive charges on each two hydrogen atoms of the adjacent molecules of water — a comparatively loose bonding than the one realized in hydrogen / covalent bonds. When the temperature of water is lowered below 4o C, the water molecules, because of their asymmetrical structure come to adjust such that the oxygen poles fall apart. This peculiar arrangement of oxygen atoms results in the build up of a crystal lattice known as our “ice”. So we can infer that the irregular stacking of water molecules below 4 degree Celsius increases the denominator “volume” of the density ratio, thereby reducing the factor of density instead. The above stated difference of water molecules in liquid and solid states is determined to be 9%, i.e. water is 9% denser than ice. Why doesn’t an iceberg melt? It is interesting to know that the icebergs in the Antarctic seas don’t seem to melt while floating. It is actually the difference of temperature above and below the water line that prevents an iceberg from melting. As we know that the atmospheric temperature there is not higher than the internal temperature of the iceberg; this is the justification. When there is a climactic increase in temperature, icebergs begin to detach from huge mass and begin to float away on the surface of water, melting out eventually. The drastic changes in the atmospheric temperature are a long debated issue dubbed as ‘Global Warming’ that is directly responsible for a sheer increase in polar ice melting. It is feared that in case there is a considerable rise in atmospheric temperature, and the huge icebergs happen to float and melt in great numbers, there is a great threat of seashores overflowing, just like tsunami. This is what the advocates of Global Warming phenomenon profess and warn everywhere in the world. Why Sugar Dissolves in Water?